A ritual experienced by all those who went to sea in sailing ships was ‘taking a tow’. 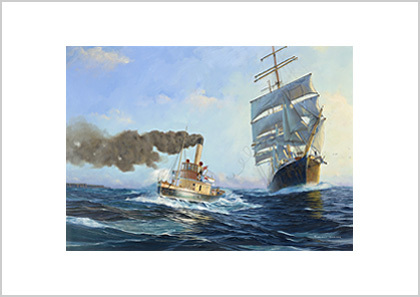 Sailing ships could rarely enter port under sail and had to be towed in to their berth. It was accompanied by much activity by all those on board. 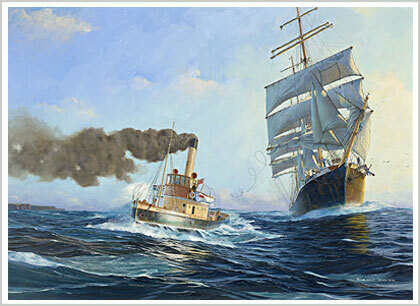 Prior to taking the tow line, sail would be reduced so that the speed of the sailing ship could match that of the tug. In this painting the upper sails – topgallants and royals, are furled and the courses are ‘up in their gear’, meaning that they are hauled up to the yards but not furled at this stage. The topsails are always left to last as there might be a reason to abort the tow at the last moment. In this case the sailing ship must have the ability to get going again quickly. The breeze is setting in towards the land and the sailing ship skipper must judge the right moment to take in the remaining sail. It can be seen that the anchors are already over side, with the mate observing that all is ready for them to be dropped when needed. The ‘heaving line’ was a light, small diameter rope attached to the heavy tow rope. It was weighted at one end. One of the skills necessary for an AB (able seaman) to possess was to coil the heaving line neatly so that it would not tangle and to heave it so that it landed where it could be caught. As this was an imaginary painting intended to illustrate the activity surrounding ‘taking a tow’ I could choose any two vessels. 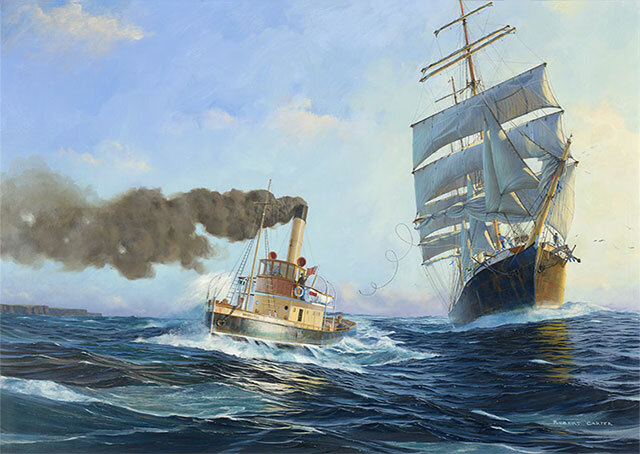 The Finnish 4-masted barque Olivebank seemed to fit in nicely, as did the tug Waratah, which has been restored and is now operated by the Sydney Heritage Fleet.